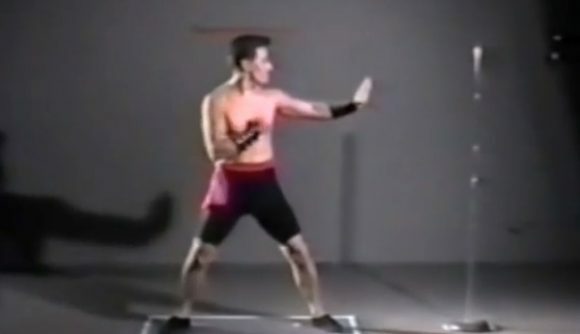 The original Mortal Kombat was notable not only for its violence, but also its use of digitised live actors to represent all the game’s characters. The uppercut and air kick animations are some of the most memorable bits in fighting game history, even if some of those characters are bolstered palette swaps. Midway saved the footage used to create those characters, and yes, it’s just as terrific as you’d expect. This footage has been on the internet for ages now, but as we come upon the release of Mortal Kombat 11 the clips have made the rounds again, thanks to a gallery of GIFs that recently got posted to Reddit. If you want the highlights, that gallery is a good place to start – some of the highlights include Sonya’s uppercut and Johnny Cage’s low blow. My favourite, though, is Kano’s dropkick, which features actor Richard Divizio perched on top of a small staircase and tumbling over. I can’t help but hope that this somehow gets referenced in MK11 – and given NetherRealm’s penchant for in-jokes and easter eggs, it easily could be. You can see that beautiful Kano footage in full below. The other motion capture sessions are spread out all over the internet, so for your convenience, here are Raiden, Liu Kang, Scorpion, Johnny Cage, and Sonya Blade. The Mortal Kombat 11 roster is looking fancier than ever, which is surely a good thing – even if we don’t get the 90s charm of digitised actors and exploding rib cages anymore.